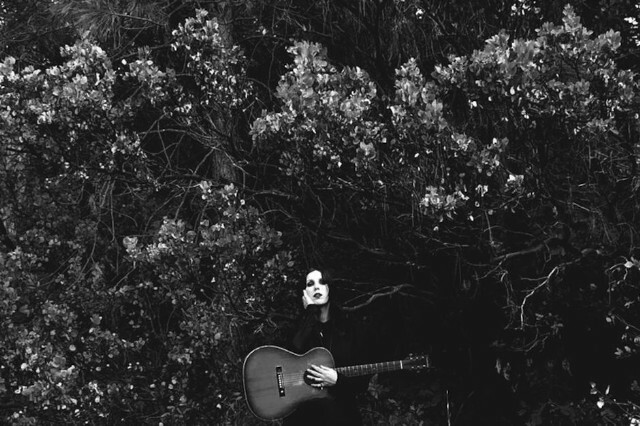 Between references to the River Styx, lamentations of psychic emptiness, and the terrors of our own uncontrollable emotions, Chelsea Wolfe finds calm on “Crazy Love,” just slightly beyond the middle of her terrific fourth album, Abyss. Closer in execution to the 2012 acoustic collection, Unknown Rooms, than the rest of her discography, its hoary, descending violin tones and gently strummed acoustic guitar provide a brief respite from the earthquake electronics of the remaining ten tracks. The California singer-songwriter has risked being pigeonholed for embracing more than a few metal elements in her music (and her wardrobe skews black and flowing), but she draws from influences as vast as the state she calls home: Townes Van Zandt’s gravestone — which she and her new band visited on a pilgrimage while recording Abyss in Dallas — flashes by briefly in the LP’s trailer. Of course, Wolfe, a voracious reader, has always drawn inspiration from unusual sources. She wrote “The Waves Have Come” off of her 2013 album, Pain Is Beauty, following the devastating Japanese tsunami, and Abyss’ push-pull between her breathy verses and pummeling chorus, “Iron Moon,” is a ferocious paean to a Chinese factory worker and poet who killed himself; and the slowly scraping “Maw” followed Robin Williams’ suicide. (Part of the reason she moved an hour and a half to the mountains north of Los Angeles was to escape her susceptibility to the energy and emotions of other people around her.) Perhaps the most unexpected well of inspiration, however, came from Wolfe herself: the notoriously reticent performer, who used to wear a veil to shield herself from the audience’s uncompromising stare, has also shied away from sharing her personal life in either lyrics or when interviewed. Abyss, titled after a chapter in psychologist Carl Jung’s autobiography (1963’s Memories, Dreams, Reflections), was especially affected by Wolfe’s thoughts and behavior during non-waking hours; namely, sleep paralysis. Though it’s also easy to rely on such a compelling narrative as the album’s sole throughline, the subtext creeps up only occasionally, in lyrics like “Chasing the sun / I can’t wake up / Scream and run / Don’t let them win” over ominously building organs on “After the Fall,” which decrescendos into blipping synths and Wolfe’s distant, distorted cries; or in the nightmarish video for “Carrion Flowers,” shot in twitchy stop-motion like a horror movie trailer. The album itself ends on a terrifying note, scattered twinkling piano keys behind Wolfe barely murmuring, “Lost and alone in confusion / I’m screaming / But I can’t wake up,” as her band’s newest member, violist Ezra Buchla, scrapes away in the background. Wolfe told White Lung’s Mish Way in a recent interview that producer John Congleton (Explosions in the Sky, St. Vincent) is much of the reason why Abyss plunges to such bitter lows: “I kind of had to let go a little bit,” she says. “My approach to the album was very warm and hazy, and [Congleton’s] was more cold.” Indeed, she extracts new shades of pain in her ever-evolving voice, and the death-march drums of “Grey Days” and terrifyingly warped cries opening “Dragged Out” push her further into the murky middle ground between metal and the so-called “doom folk” that’s been branded hers. You won’t find an instantly intoxicating, remix-ready track like Pain’s “Warden” anywhere on there; this time Wolfe fully embraces the eerie darkness that’s always trailed her work. Abyss weighs unnecessarily heavy at times — the obvious premise and barely-there smack drum of “Simple Death” doesn’t hold up against the other songs’ more nuanced examinations of the macabre subjects — but Wolfe makes a convincing case to follow her into the underworld.